Not really! Apar of Random Ruminations tagged me yet again 🙂 This time though it was a tag I loved doing. As you can see from the very nature of my blog, I love sharing. My personal life, my hurts, my successes and occasionally pictures. The rule of this tag is to publish an old (10 years old or more) candid picture of you. I am bending the rule some simply because I do not have any candid pictures of myself. All the pictures I have are posed. 😦 I have plenty of candid pics of my family, friends specially since I am click happy with a camera in hand. After much thought I decided to pick this one. I love this picture not only because it is natural. I am posing yes but in the shy awkward way only a child can. I remember the day this was taken. In 1984. I was in middle school I think or just starting middle school. I was at my maternal grandma’s home on the occasion of my Uncle’s visit. He was the only one we knew who had a camera and wanted to take a picture of his then favorite niece. I had woken up but no where near picture ready. 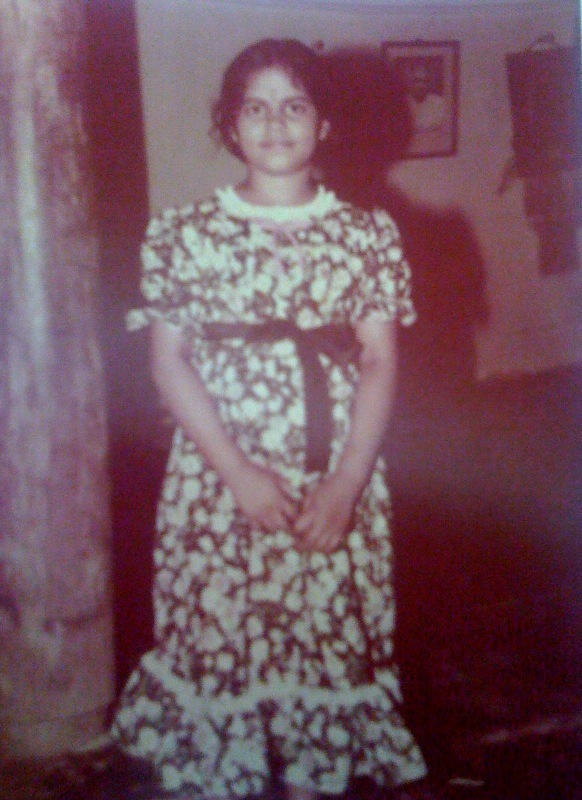 My mom hurriedly put a spot of kumkumam on my forehead and tied a black ribbon around my waist since the dress was way too big for me. I remember posing happily that mama wanted a picture of me. In the background barely noticeable is my maternal great grand father in the picture and the pillar that is the hallmark of a home in an agraharam. This photo represents to me all the nostalgia and happiness that childhood represents. By sharing this, I am sharing a very sacred part of my life. I am tagging no one in particular since I know many of them are wary of uploading personal pictures online. However, if you do decide to post a picture of you ten years or older, do leave a comment and I would LOVE to check it out. Very natural photo, loved your description on the history of the picture. Beautiful picture Laksh, brimming with innocence 🙂 The black ribbon fits so naturally with the dress. Cute pic Laksh. Definitely brings out the innocence as a child. I can so much relate to the happy memories that flood one’s thoughts when seeing a old photo. As Suman says, the black ribbon goes very well with the dress. Mom’s designer touch with the black ribbon really worked.thanks for sharing the pic, story and the innocence of the childhood. It’s not all lost; your face did not change much from then! Remember seeing this picture during one of those late night sessions in our first shared room – the first thought then that came to my mind was “a pretty frock and you haven’t changed much” and that is what I thought this morn when I looked at this picture. I am totally confused!! I posted the previous comment using my credentials as “Naan”, however the previous comment of me, points to a different blog address. Do you know why? awwwwwww!! you really haven’t changed much since then! Yes very candid and beautiful blog and picture. I read your blogs regularly and like them but never commented on one. But this blog tops them all. Kudos, you express yourself so well! Beautiful pic and the only change that I find in your pics if I compare is the big smile that is missing in this shy little girl snap. Love the post too. @Mitr: Thank you. This photo is special to me. @naan: Thank you! Old photos have a charm much like the eastman color movies. @Akay: Thank you! Thank you! @naan: Fixed your link. Not sure how it got changed. @Shalu: I look at your pict at my wedding and your recent ones and go awwww! @sl: Thanks for writing in. I am touched. Thank you again. @Rupa: The word “frock” itself brings back so much memories. @Abi: Thank you. Nice to retain something of our childhood in us right?